Wrapping paper packaging is gaining momentum in the global fast food packaging market due to its ease of storage and good functional properties to keep food fresh for a long period of time. It is extensively used for fast food packaging at quick service restaurants, full-service restaurants, cafes, and other institutions. Wrapping paper for fast food packaging is generally made of materials such as paper, PP, PE, PVC, EVOH, and biodegradable materials. Paper-based wrapping papers utilize raw materials such as kraft paper and specialty papers such as greaseproof papers, wax-coated papers, and foil papers. These papers are available in a variety of thicknesses ranging from less than 8 microns to more than 20 microns. Primary end uses for fast food wrapping paper are sandwiches, burgers, pizzas, chicken, and other snack foods. The demand for fast food wrapping paper is increasing at a decent growth rate in both developed as well as in developing countries. This is primarily due to the high growth in the on-the-go and the fast food market globally. The global fast food industry generated revenues of more than US$ 250 billion in 2017. Consumers in developed countries such as U.S., Germany, Italy, France, and Norway spend a huge amount of money on fast food products, which, in turn, boosts the demand for food wraps in these countries, during the forecast period. However, the demand for fast food is also expected to increase substantially in developing countries such as India, China, Brazil, etc. in the next ten years. The global demand for fast food wrapping paper is largely generated from major countries including the U.S., China, Germany, Italy, France, Canada, and Scandinavian countries. Growth in these countries is fuelled by the inclination of the consumers and companies towards the adoption of eco-friendly packaging solutions. This will not only help food-service companies to create a better brand image, but also increase customers in the long term. The market demand is expected to be hampered due to the increasing prices of raw materials and lack of qualified labor. Giant multinational food-service companies such as McDonald’s, KFC, Burger King, etc. have already adopted paper-based packaging solutions and eliminated plastic packaging solutions. The paper-based fast food wrapping paper segment dominates the global market accounting for more than a billion dollars in its 2017 revenues. Specialty papers such as, greaseproof papers have gained significant attention in the past and the demand has increased significantly since then. Major quick service restaurants are already offering their fast food products in paper-based wrapping products. The burger segment is the single largest segment observed in the fast food wrapping paper market, which accounts for more than one-third of the global market. Fast food wrapping papers are extensively used for the packaging of millions of burgers sold every day across the globe. 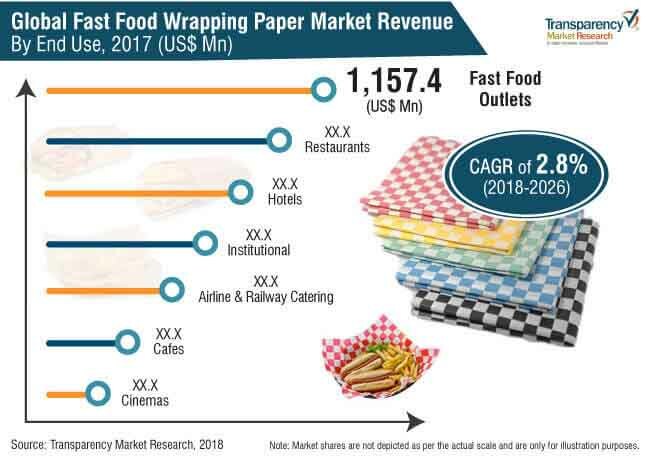 However, other fast food types such as wraps and rolls, chicken, and sandwiches are significantly gaining traction in the market and are expected to account for the major growth in the fast food wrapping paper market, during the forecast period. Some of the prospective customers in the fast food wrapping paper market are Subway, McDonald’s, Starbucks, KFC, Burger King, Pizza Hut, Domino's Pizza, Dunkin' Donuts, Hunt Brothers Pizza, Wendy's, Orange Julius, etc. Each of the above-mentioned companies uses millions of tonnes of packaging to fulfill their day-to-day packaging needs. However, the supply of fast food wrapping paper is overflown due to an increasing number of manufacturers in each region, which in turn creates an intense competition in the global fast food wrapping paper market. Fast food companies are taking environment-friendly initiatives to curb their packaging waste and reduce pollution generated from plastic-based packaging products. North America accounts for the largest market share in terms of production of sophisticated and functional fast food wrapping paper. In North America, the U.S. dominates the market with a market share of more than 2/3rd of the market. Consumers in the U.S. spend a large sum of money on fast food items, which in turn drives the fast food wrapping paper market in the region. The consumption is growing with the introduction of varieties of fast food items by restaurants. North America is followed by the European region wherein Germany, Italy, U.K., and France dominate the market with consumption of thousands of tonnes of wrapping paper every year. A major portion of the growth in the global demand for the fast food wrapping paper comes from the developing countries of Asia-Pacific and Latin America region. Potential countries include India, China, Brazil, Mexico, and ASEAN countries where consumption of fast food items is growing at a much faster pace and is expected to create huge growth opportunities for the multinational as well as local companies. Fast food wrapping paper for consumer use is extensively supplied with the intact distribution channel of suppliers through small-scale retail shops, hypermarkets, supermarkets, and other convenience stores. However, food wrapping paper for food service outlets is supplied directly by manufacturers or distributors. In the MEA region, countries such as Saudi Arabia and UAE are the major contributors to the demand for fast food wrapping papers. MEA represents enormous growth opportunities for the wrapping paper manufacturers due to high development and increasing penetration of the retail industry in the region. Japan also offers untapped growth opportunities in the global fast food wrapping paper market.